I've been catching up on my Runner's World and Running Times issues going back to January and I'm saddened to see so many items and stories that reference the Boston Marathon. Who could have anticipated what happened at 4:09:43 in the race? I've wondered about the time the cowards picked to set off the bombs. 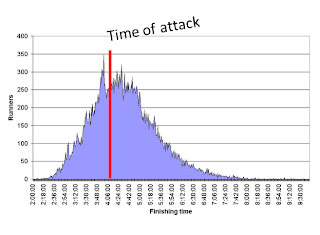 Was it a coincidence that the highest number of people typically cross the line around the 4 hour point? My anger continues. Today's schedule has me on the phone much of the day, and my window to run this morning coincided with some rainy weather outside. I ended up doing a typical treadmill run while I watched the news on TV. It was mostly a repeat of the Boston story. How many ways can you talk about something like that when there's no new information to share? Apparently, there are many. The London Marathon happens this Sunday and, of course, there's a heightened concern for safety after Monday's bombings. 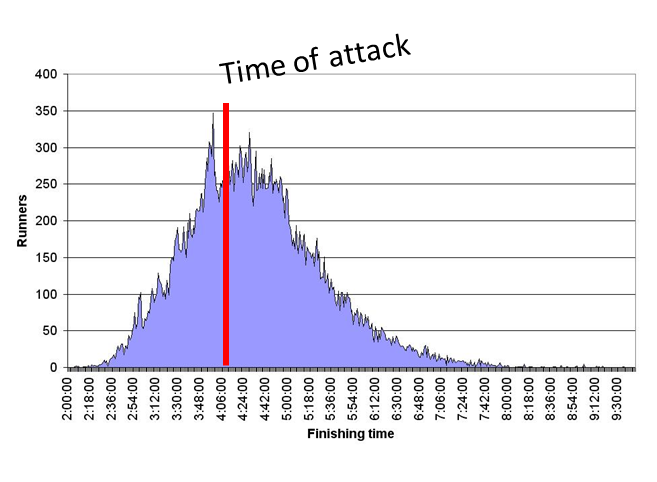 The good news is that the London Olympics went off without any terror attacks last summer and they will probably use those same tactics to keep the crowds safe this weekend. The bad news is that the safety concerns for the race are now a bigger story than the race itself.